11/17/2013 ~ My chili pepper seeds come from a chili ristra I bought about a decade ago. It finally fell to the pressure of the wind and I began composting it, a little at a time because of how hot chili is. After I began using the compost, I had volunteer chili pepper plants in all sorts of unexpected places. Seeds are such a source of wonderment! 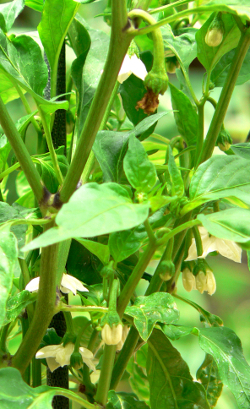 These are the kind of chilies that are great for rellenos. 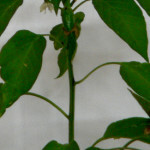 So, it will be fun to see if my indoor chilies get as big as the ones grown outside this last summer. 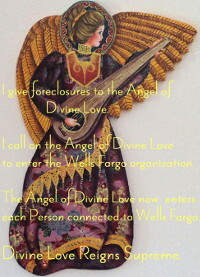 I took the above photo today. 11/30/2013 ~ Adding Tinfoil ~ It looks to me as if the chili has grown a quarter of an inch longer and gotten thicker. It’s now twisting around a bit toward the back of the stem. Because the pictures weren’t taken at exactly the same distance, the growth isn’t as clear as it could be. I took a picture, despite the fact the changes aren’t spectacular, because I put tinfoil around the base of each of my two chili pepper plants, to increase light for them. I did that because years ago I read Square Food Gardening which said that tinfoil around the base of a plant in the shade significantly increased the light it received, and thereby encouraged growth. 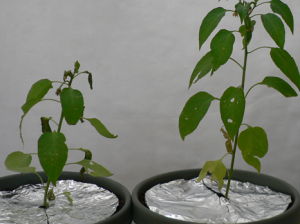 I did an experiment in my garden, and sure enough, there was a BIG difference in the plants grown with tinfoil, as opposed to those grown without. Picture. 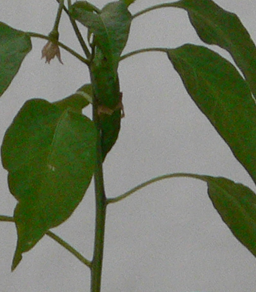 My other chili pepper, also brought in from the raised bed on my deck, next to the north facing wall of my bedroom, seems to be gaining steam. 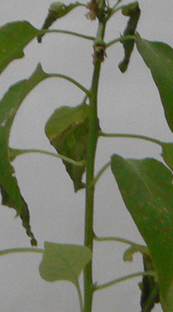 It’s producing new branches at the base of its rather dilapidated leaves. 6/21/2014 ~ The little chili plant didn’t make it, but the larger one is doing gangbusters outside, totally outshining its rivals newly arrived from Burpee. Look at the number of flowers it has. I wanted you to see this aspect more than its height. 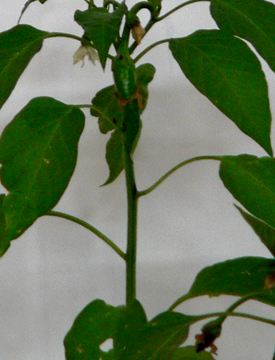 I don’t know if it will be able to bring each flower to full fruition in a chili pepper, but… I’m hopeful. 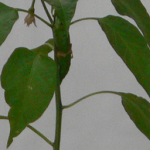 Clearly Solatube is a great aid to wintering chili pepper plants so that you have a jump start come the following summer.